The figures published in the Flight Manual for the performance capabilities of a certain model of airplane are always related to standard atmosphere (29.92 inches of mercury at 15° C at sea level). However, only rarely will the airplane actually operate under conditions that approximate standard atmosphere. Any increase in temperature or altitude means a decrease in the aircraft's optimum performance. Air density decreases with altitude. At high elevation airports, an airplane requires more runway to take off. Its rate of climb will be less, its approach will be faster, because the true air speed [TAS] will be faster than the indicated air speed [IAS] and the landing roll will be longer. Air density also decreases with temperature. Warm air is less dense than cold air because there are fewer air molecules in a given volume of warm air than in the same volume of cooler air. As a result, on a hot day, an airplane will require more runway to take off, will have a poor rate of climb and a faster approach and will experience a longer landing roll. In combination, high and hot, a situation exists that can well be disastrous for an unsuspecting, or more accurately, an uninformed pilot. The combination of high temperature and high elevation produces a situation that aerodynamically reduces drastically the performance of the airplane. The horsepower out-put of the engines decrease because its fuel-air mixture is reduced. The propeller develops less thrust because the blades, as airfoils, are less efficient in the thin air. The wings develop less lift because the thin air exerts less force on the airfoils. As a result, the take-off distance is substantially increased, climb performance is substantially reduced and may, in extreme situations, be non-existent. Mountain airports are particularly treacherous when temperatures are high, especially for a low performance airplane. The actual elevation of the airport may be near the operational ceiling of the airplane without the disadvantage of density altitude. Under some conditions, the airplane may not be able to lift out of ground effect or to maintain a rate of climb necessary to clear obstacles or surrounding terrain. Density altitude is pressure altitude corrected for temperature. It is, in layman terms, the altitude at which the airplane thinks it is flying based on the density of the surrounding air mass. Too often, pilots associate density altitude only with high elevation airports. Certainly, the effects of density altitude on airplane performance are increasingly dramatic in operations from such airports, especially when the temperature is also hot. But it is important to remember that density altitude also has a negative effect on performance at low elevation airports when the temperature goes above the standard air value of 15° C at sea level. Remember also that the standard air temperature value decreases with altitude. In order to compute the density altitude at a particular location, it is necessary to know the pressure altitude. To determine the latter, set the barometric scale of the altimeter to 29.92" Hg and read the altitude. Density altitude can be calculated for any given combination of pressure altitude and temperature, by using the circular slide rule portion of a flight computer. Your Airplane Flight Manual publishes information, usually in chart or table form, on the take-off performance of a specific model of airplane. As a pilot, you should familiarize yourself with these charts/tables, to be able to predict how your airplane will perform under varying atmospheric conditions and you should refer to these charts/tables whenever there is any doubt that the takeoff conditions may not be sufficient for the performance capabilities of the airplane. In addition, it is important to remember that the charts/tables for any particular airplane were compiled from performance figures of factory new equipment in optimum conditions. Any typical general aviation airplane, with considerable time on both airframe and engine, will have a poorer performance potential than that predicted by the charts/tables. In addition, under-inflated tires, dragging brakes, dirt on the wings, etc., will also affect performance negatively. If after calculating density altitude and checking the tables, it appears that the take-off run will require more runway than is available, you, as pilot-in-command, have several alternatives. You can lighten the load, if possible, or you can wait until the temperature decreases. Generally, the most critical time for flight operations when the temperature is very hot is from mid-morning through mid-afternoon. This is especially true at high elevation airports, but even at lower elevations, aircraft performance may be marginal. Aircraft operations should, therefore, be planned for early morning or late evening hours. It is important to remember that in taking off from airfields that are at high elevation, you should use as a reference the same indicated airspeed that you would use during take-off from an airfield at sea level. It is the true airspeed and groundspeed that is affected by the increase in elevation and temperature. Your Airplane Flight Manual also publishes data for climb performance. The maximum, or best rate of climb, is the rate of climb which will gain the most altitude in the least time and is used to climb after take off until ready to leave the traffic circuit. Many Airplane Manuals also publish charts for cruise climb. Cruise climb, or normal climb, is the climb airspeed used for a prolonged climb. The chart indicates the fuel used, time required to reach altitude, and still air distance covered in order to reach various altitudes when climbing at a certain indicated airspeed with various power settings. Performance figures for cruise at gross weights are also given in most Airplane Flight Manuals. These charts show the fuel consumption, true airspeed, endurance and range that may be expected when cruising at a certain altitude with the engine being operated at normal lean mixture at various combinations of rpm and MP settings (to give a required % of power). Perfect landings are usually preceded by deliberately planned, and well executed approaches. Correct approach speeds are important. Your Airplane Flight Manual for any particular model of airplane recommends the speeds to use on approach with various flap settings. These airspeeds should always be used. On some airplanes, the manufacturer may require a particular approach speed for all weights because, during certification flight testing, it was found that for stability and control reasons, or for go-around safety, a fixed airspeed is required. Always comply with the manufacturer's recommendations. Since there is some loss in the quality of braking action on the grass of a sod runway, the ground roll after landing can be expected to be longer than it would be on a hard surface runway. Density altitude affects the landing performance of an airplane as greatly as it affects take-off performance. High temperature and high elevation will cause an increase in the landing roll because the true airspeed is higher than the indicated airspeed. Therefore, even though using the same indicated airspeed for approach and landing that is appropriate for sea level operations, the true airspeed is faster, resulting in a faster groundspeed (with a given wind condition). The increase in groundspeed naturally makes the landing distance longer and should be carefully considered when landing at a high elevation field, particularly if the field is short. Some Airplane Flight Manuals contain performance charts and tables, which relate landing distance to density altitude. Pilots should develop the habit of referring to these charts/tables in order to anticipate the distance that will be required to safely land their airplane under various conditions of flight. An accumulation of frost, snow or ice on the wings or other horizontal surfaces will substantially alter the lifting characteristics of the airfoil. Even a very light layer of frost spoils the smooth flow of air over the airfoil by separating the vital boundary layer air, producing an increase in stall speed and a decrease in stall angle of attack. It has been proven that a few millimetres of ice will increase the stall speed by as much as 20%. Any substantial accumulation of snow or ice, in addition to adding significantly to the weight of the airplane, so drastically disrupts the airflow over the wing, that the wing may not be able to develop lift at all. There are a number of major factors that contribute to critical surface contamination and a knowledgeable pilot will recognize them as indicators of an icing condition. Ambient temperature provides a good indication of the potential for icing conditions. Aircraft surface temperature indicates the susceptibility of the aircraft to icing. Aircraft surface temperature is affected by solar radiation. An aircraft will have a warmer surface temperature on a sunny day than on an overcast day with identical ambient temperatures. When the fuel in a wing fuel tank is very cold, the cold fuel in the tanks can so chill the aluminium. wing surface that moisture in humid air or rain will turn to, frost or ice over the fuel tank. Be alert to the conditions that cause icing even before going out to, your aircraft. Get a thorough weather briefing and the most up-to-date forecast so that you are aware of temperatures and precipitation at your stops and enroute. Examine your aircraft very carefully prior to flight. Use your eyes and hands to examine the surfaces to ensure that your aircraft is "clean" before departing on a flight. Have the aircraft de-iced by ground crews if there is any contamination. Be sure that the de-icing fluid is used evenly on both sides of the aircraft and on the under as well as the upper surfaces. Use wing covers to protect your aircraft when it is parked. A gust or bump increases the load on the wings. The speed of the airplane should therefore be reduced when flying in gusty air. In approaching to land, on the other hand, a little higher speed should be maintained to assure positive control. Every pilot has encountered the term ground effect. What exactly is it? The total drag of an airplane is divided into two components, parasite drag arid induced drag. Induced drag is the result of the wing's work in sustaining the airplane. The wing lifts the airplane simply by accelerating a mass of air downward. It is perfectly true that reduced pressure on top of an airfoil is essential to lift, but still that is but one of the things that contribute to the overall effect of rushing an air mass downward. The amount of downwash is directly related to the work of the wing in pushing the mass of air down and therefore to the amount of induced drag produced. At high angles of attack, induced drag is high. As this corresponds to lower airspeeds in actual flight, it can be said that induced drag predominates at low speed. When a wing is flown very near the ground, there is a substantial reduction in the induced drag. Downwash is significantly reduced; the air flowing from the trailing edge of the wing is forced to parallel the ground. The wing tip vortices that also contribute to Induced drag are substantially reduced; the ground interferes with the formation of a large vortex. Many pilots think that ground effect is caused by air being compressed between the wing and the ground. This is not so. 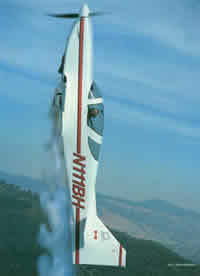 Ground effect is caused by the reduction of induced drag when an airplane is flown at slow speed very near the surface. Ground effect exerts an influence only when the airplane is flown at an altitude no greater than its wing span, which for most light airplanes is fairly low. A typical light airplane has a wing span of perhaps 35 feet and will experience the effect of ground effect only when it is flown at or below 35 feet above the surface (ground or water). A low wing airplane is generally more affected by ground effect than a high wing airplane because the wing is closer to the ground. High wing airplanes are, however, also influenced by this phenomenon. Pilots get into trouble because of ground effect when they precipitate take-off before the airplane has reached flying speed. Take the scenario of a pilot trying a take-off from a poor field. He uses full power and holds the airplane in a nose high position. Ground effect reduces induced drag and the airplane is able to reach a speed where it can stagger off. As altitude is gained, induced drag increases as the effect of the ground effect diminishes. Twenty or thirty feet up, ground effect vanishes, the wing encounters the full effect of induced drag and the struggling airplane which got off the ground on the ragged edge of a stall becomes fully stalled and drops to earth. Ground effect is also influential in landing. As the airplane flies down from free air into ground effect, the reduction of induced drag as it nears the runway comes into, effect to make the airplane float past the point of intended touchdown. In the common case of an airplane coming in with excessive speed, the usable portion of the runway may slip by with the airplane refusing to settle down to land. A go around will probably be necessary. On short fields, approach as slowly as is consistent with safety. An airplane also tends to, be more longitudinally stable in ground effect. It is slightly nose heavy. The downwash from the wing normally passes over the tail at an angle that produces a download on the tail. Ground effect deflects the path of the downwash and causes it to pass over the tailplane at a decreased angle. The tailplane produces more lift than usual and the nose of the airplane tends to drop. To counteract this tendency, more up elevator is required near the ground. During take-off as the airplane climbs out of ground effect, the download on the tailplane increases and the nose tends to pitch up.